Having trouble buying from the Zappos online store because you don't live in the USA? The Zappos store doesn't ship internationally so unfortunately you can't buy from them directly if you live outside of America. Big Apple Buddy, your personal shopper, can help you buy from the official Zappos store and deliver the items to you in Australia, Austria, Belgium, France, Germany, Hong Kong, Ireland, Israel, Italy, Japan, Kuwait, Malaysia, the Netherlands, New Zealand, Norway, Saudi Arabia, Singapore, Spain, South Africa, Sweden, Switzerland, Taiwan, Thailand, the United Arab Emirates, the UK or anywhere else in the world. Just tell us what items you're after (e.g. 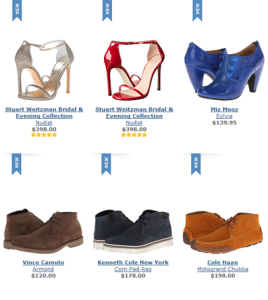 Stuart Weitzman pumps, Timberland boots, Cole Haan wedges) and we'll put together a free shipping quote for you.